From halves in quarters in KS1 to equivalent fractions in KS2, primary teacher Phoebe Doyle offers some insiders’ tips to help you help your child at home, plus details of fraction walls, hundred charts and other useful maths resources. In Year 1 children will learn about halving numbers. This will mainly be focused around numbers 0-20, but they’ll also learn to divide specific large numbers (for example, they might be able to tell you that half of 100 is 50, or that half of 200 is 100). The best way to show children halving, is to actually give them an even number of objects (for example: sweets, pasta shapes or counters). Ask them to divide the group into two groups of the same number. They may not be sure of how to do this, so you may need to draw two big circles on a piece of paper and show them how to share the objects, one by one, into the two circles. In Year 1, children also learn to find quarters of shapes or sets of objects. You can help your child with this by giving them various shapes (circle, rectangle and square) and asking them to divide them into quarters and then colour one quarter. Use mealtimes as an opportunity to practise recognising halves and quarters, too. Could you get them to divide a pizza or cake into quarters and then give one quarter to someone? Remember to point out that one quarter is 'one piece out of four' and is written like this: 1/4. In Year 2 they’ll continue learning about halves and quarters. This will also coincide with learning more about telling the time on an analogue clock, as they’ll be beginning to tell the time to the nearest half past/to and quarter past/to the hour. By the end of Year 2 children should be able to, for example, colour in a half or a quarter of a shape. They should also be able to tell you what a half or a quarter is of any even numbers 0-20. Dolls are on special offer, they normally cost £10 each but have been reduced to half price. How much will one doll cost now? Get your child used to reading through problems like this carefully, underlining important numbers and words. If they need to find a quarter of a number of objects, for example 1/4 of 12, it is always a good idea to get them to actually count out 12 objects and then divide them into four equal groups. It may be a good idea to draw four circles on a piece of paper so that they are clear about how they are dividing the shapes. 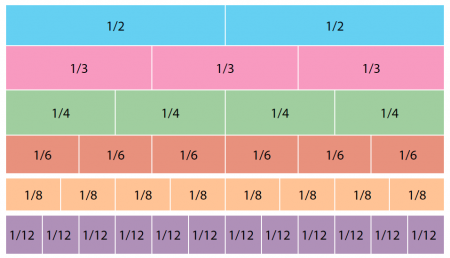 A fractions wall is a useful tool that children are likely to use at school and helps them to visualise how fractions relate to each other in size. Look at a fraction wall together and ask your child questions related to it, such as: How many halves make up one whole? How many eighths make up one whole? A 0-1 number line is another helpful prompt when learning about fractions, and asking them to have a go at writing in fractions onto an empty one can be a useful task to do in itself. Divide the number line up into four sections, and ask them to label each section. Alternatively, give them an empty 0-1 number line and ask them to mark on themselves where 1/4, 1/2 and 3/4 are. In Year 3 children start to learn about trickier fractions, such as thirds and fifths. They’ll be getting more practice at writing fractions out in the correct format and they’ll be asked to colour in or mark out fractions of shapes. You can help them by giving them a shape, for example a circle, and asking them to divide it into fifths. Now give them a fraction such as: 3/5. Ask them to shade in this fraction on the circle. Then give them a rectangle and ask them to divide it into thirds. Ask them to shade 1/3. You could also ask them to tell you what fraction is un-shaded. They will need lots of practice in writing the fractions down and saying them out loud. Children in Year 3 will need to work out how to find fractions of amounts, for example: 1/3 of 12, 1/4 of 16, etc. Again, using small objects as counters will really help them with this. If they need to find 1/5 of 15, get them to count out 15 objects. Explain that because they are finding 1/5, they need to divide the objects into five equal groups. You could draw 5 circles on a piece of paper to help them with this. Once they have done this, explain to them that each circle contains a fifth of 15 (3). Once they have got the hang of this, they will need to start using mental division for working out these kinds of questions (for example: 1/4 of 20 is the same as 20 ÷ 4, which equals 5). As with all areas of maths learning, showing children how their new numeracy knowledge can help them in real-life scenarios is very valauble, and food is a fantastic fractions resource. Try doing some pizza making – have them put different toppings evenly across a pizza. Then encourage them to work out, for example, if they’ve put 10 olives evenly on the pizza and cut the pizza into 5 even pieces, how many olives on each? Chocolate that is marked out in sections is another good edible resource. Ask your child to say how many sections would make up one third of the bar. If they answer correctly, let them eat that fraction. Ask them to find, for example, a quarter of the remaining piece for their friend to eat. Another great activity, and something we really do use fractions for as adults, is working out recipe ingredients for a certain amount of people. So, for example, when cooking a meal for 4, using a recipe for 12, ask your child to help you work out one third of all the ingredients. Children learn about equivalence in Years 3 and 4, understanding that 1/2 is the same as 3/6, or 8/10 is the same as 4/5. They start to learn about equivalence with the help of diagrams, but then need to move onto recognising equivalent fractions without having to see or draw a pictorial representation. You can help your child with equivalence by using a fraction wall (see above). You can ask your child questions such as: What fractions are the same as 1/4? By looking at the wall, they should be able to tell you that 2/8 and 4/16 are the same as 1/4. In Years 5 and 6, they will start to relate fractions to decimals and percentages. An empty hundred number square really helps with this. Ask your child to colour half the squares. Explain to them that they have coloured 1/2, but they have also coloured 50/100. We write this in decimal form as 0.5. Encourage them to colour 1/4 and explain that this is 25/100 or 0.25. You can then go onto explain to them that 25% is the same as one quarter, 50% is the same as one half and 75% is the same as three quarters.